I recently got another version of Moko-chan, who came in a kimono. You might recall from some previous posts the difference between kimono and yukata, but to avoid linking here, I’ll mention one main difference, which is lining. Many tiny doll clothes sell for exorbitant prices, and Azone/Obitsu are some of the higher-end ones of these. You can get this 21cm Obitsu body for around $20, and maybe another $20for a head with rooted hair, so what you’re really paying the high price for with the Mamachapps is basically the eyes, styling of hair, and clothing. 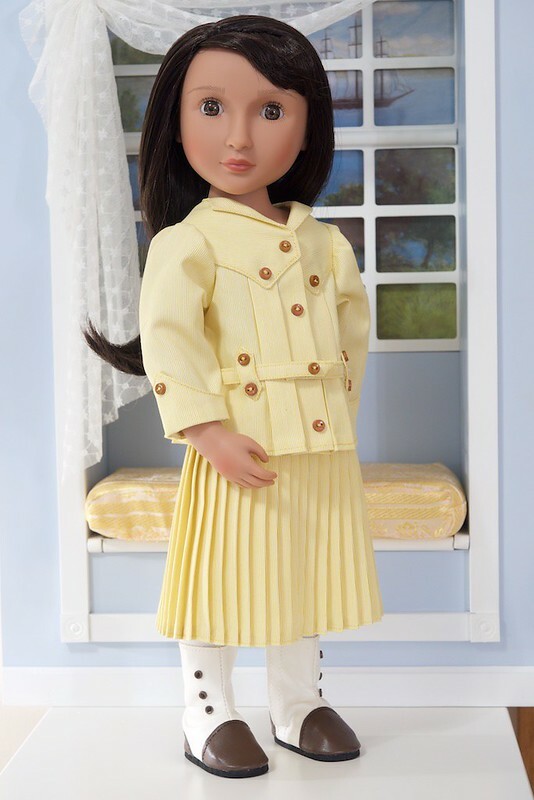 The pictures of this doll in her promotional photos made it look like she was wearing a lined kimono, so I was startled to take it off and find out that it was not only unlined, but the seams weren’t even finished on the inside! I did love the effect of the fake “lining” though, for a couple of reasons. First, it’s definitely easier and takes less fabric than lining the whole garment, and secondly, it avoids the dreaded“bulk” I’m always going on about with doll clothes. Something I found very interesting though,and wouldn’t have come up with on my own is using fabric on the BIAS for this purpose. This is a great idea that really improves the drape of the pieces, especially the lining for the body itself, helping it to curve nicely around the body rather than sticking out stiffly. Fabrics cut on the bias don’t fray the same way as those cut on the straight grain, so I can even before giving of the sleeve “lining,” although I still would have preferred it to be at least pinked. Of course, I needed to make a kimono for my original Moko-chan too, so the pattern here is based on the one her sister came with. 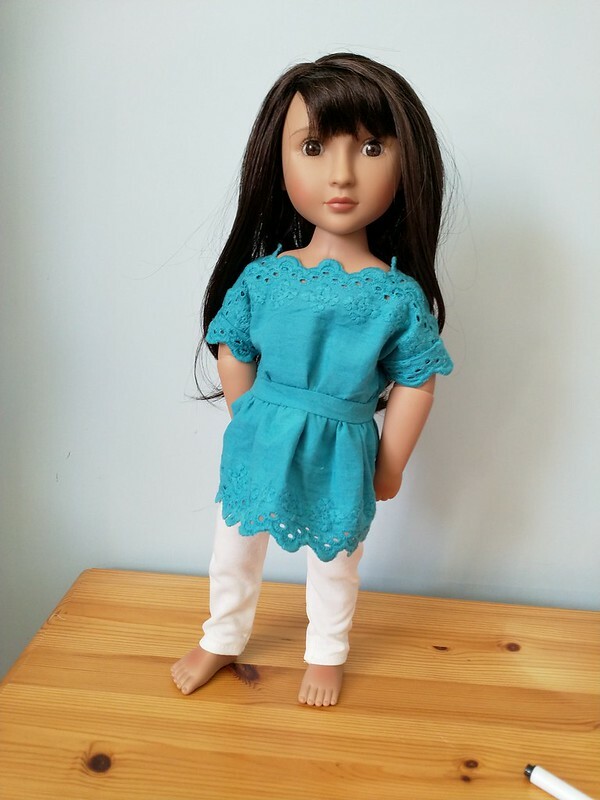 It fits an Obitsu 21-23cm body or anyone else with similar measurements such as Dal, Tiny Betsy (shorten arms and bottom hem), or even Licca and Blythe bodies. Don’t have any of those? The tutorial for fake lining can be used with any yukata/kimono pattern on the blog but is probably most useful for the small doll ones like Ten Ping or Little Darling. Reminder: Today is the last day to get your entries in for last week’s Ramble costume and the boot pattern will be emailed tomorrow. Scroll to the bottom of this post for the links! Oh my goodness…you did SUCH a nice job on the last two weeks of costumes! 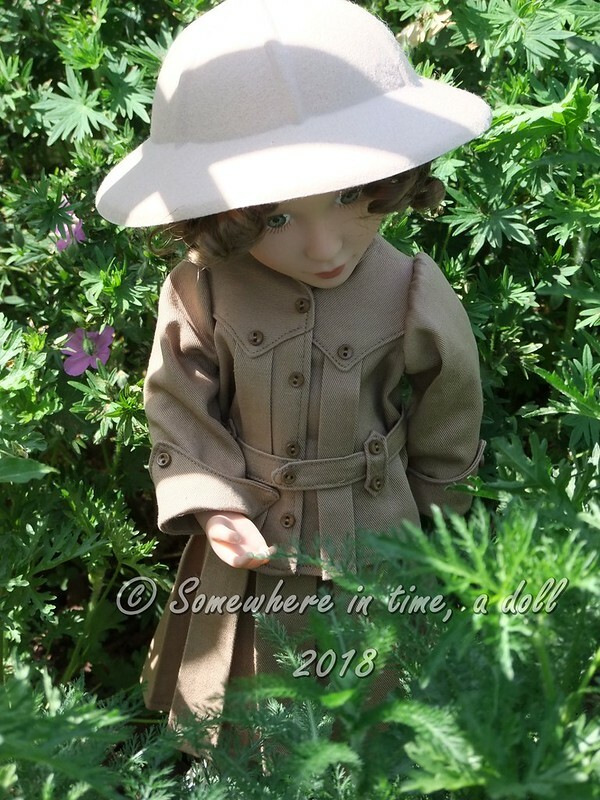 This week is an Edwardian Seaside Costume! The resized ramble from last week is not quite ready for AG size yet…next week for sure! If you want more info about the sew-along in general, please check the first week’s post. Step 3: Receive your accessory pattern by email next Friday. Boy dolls and photoshopping without photoshop! Just like you might have done, I also lined up outside the AG store before they opened on Jan 1st! The original plan was to get Luciana, and, like, all her stuff 😉 but instead I ended up with…a boy doll! Longtime followers know that boys had a major part in the blog at the beginning when I was smitten with the Kidz n Cats, and Sasha’s Gregor and Caleb have appeared from time to time too. The opportunity to do more with boy dolls was compelling, and instead of Luciana, I ended up with the doll you see above, who has a couple of names/themes right now I’m trying to decide between. I had actually made the coveralls you see him wearing for Luciana before I saw them in person, inspired by pix people had leaked of her flight suit, but lacking the right color zipper to make a blue one. When I finally saw it, I liked mine better, even though it was challenging to make. The AG flight suit just has fake stitching to simulate pockets and iron-on prints for patches. It seems like quality is going downhill lately, with terribly cheap shoes on the truly me dolls and a much cheaper body. 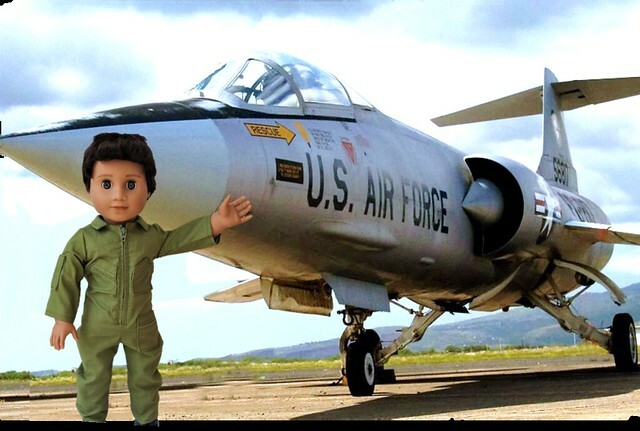 When I put the coveralls on the new boy, DH said he looked just like an air force pilot, so I put him into a pic to make it more realistic. Get the pattern and photoshopping without photoshop tutorial here! Yes, this pattern is kind of challenging, especially if you’re doing real pockets. Looking for something similar but easier? A HUGE thank you to everyone that shared their pix, and if you don’t have a Wellie, you can now get the pattern for the jammies here. Yes, they fit H4H; the top is a wee bit baggy although for PJs that shouldn’t matter much! The top would make a nice blouse too; the collar gives it a sweet, vintage feel in my opinion. How about a feedsack print with a white collar? 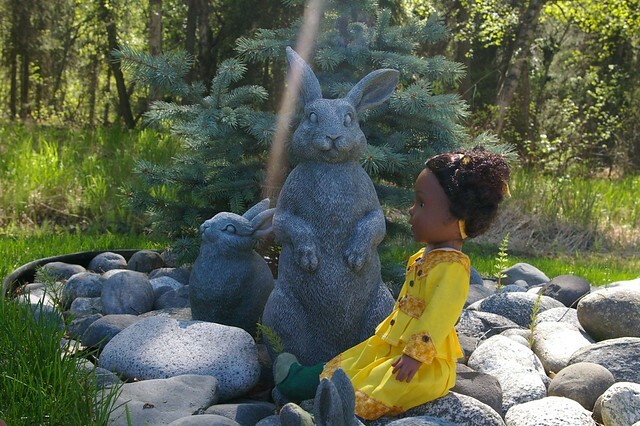 In case you’re wondering…no, these dolls are not exactly the same size. But when you overlap the closures in back to accommodate the slightly (1/2″) thinner torso of the H4H, they can share many patterns. I’m thinking I may do more for them, especially because Joanne commented and linked to FB saying the H4H are coming back! Supposedly in time for the 2016 holiday season – hooray! Draft your own pattern: undies! 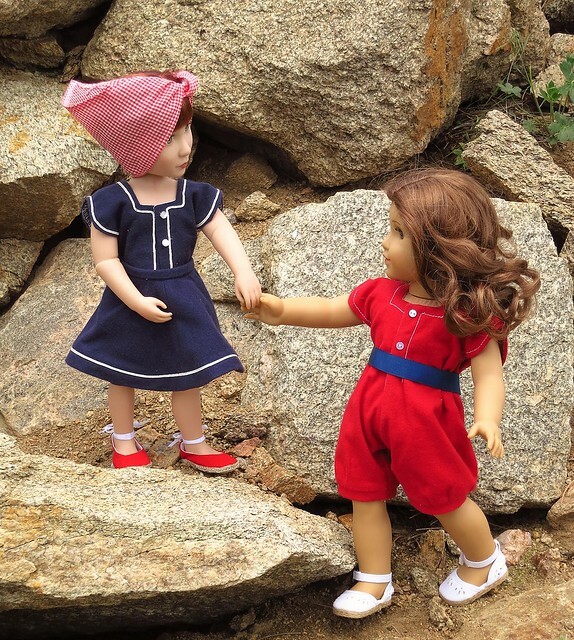 On the survey, LOTS of people wanted undies for every doll you could think of, but it’s time for true confessions here…my dolls usually don’t wear them! 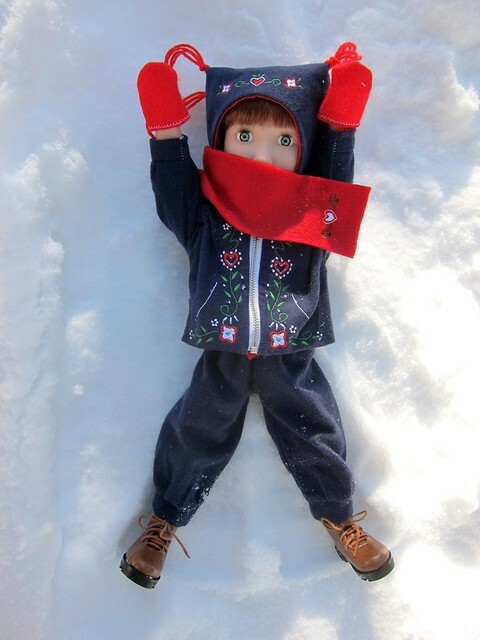 At small scale they may actually affect the fit of pants, and more importantly, often when I’m doing a photo shoot, the doll needs to be able to undergo lots of fast clothing changes. If the undies interfere, off they go! The only exceptions I make are for historical dolls that wear bloomers and dolls that came with underwear that fits so tightly it doesn’t impact the fit or rapid changing of clothes. 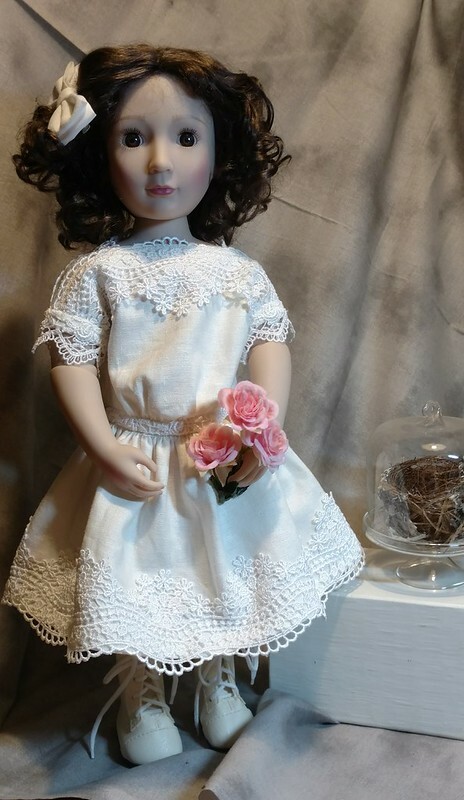 But you said you wanted them, and I strive to make this blog helpful to the doll sewing world, so here’s a tutorial on how to make them for ANY doll. If your dolls also don’t wear undies, adapt this to make a swimsuit instead. Well, this pattern was more difficult to figure out than I had anticipated, but I did promise it would be free… So today you can download (FREE!) the blouse part of the overall outfit you voted for a few weeks ago. BUT make sure to download it today, because it’s going to disappear tomorrow! Next week we’ll make the overalls. The expanded version of the pattern, available all at once in my etsy shop right now, also includes a puffed sleeve variation, a skirt to make the overalls into a jumper AND an additional set of pattern pieces sized for slim dolls like Sasha/Kidz n Cats/Girl for All Time/Kathe Kruse. Really, Jen? 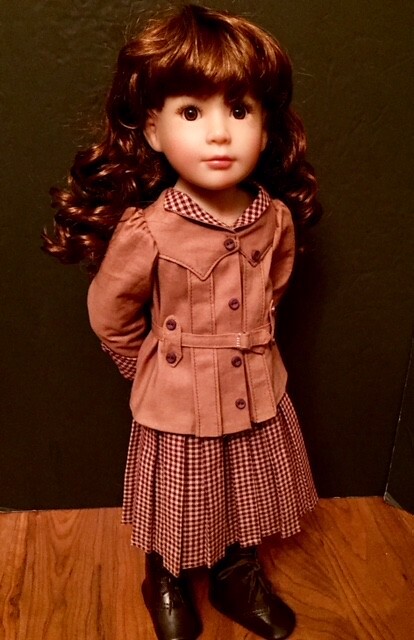 MORE doll clothes? YES! 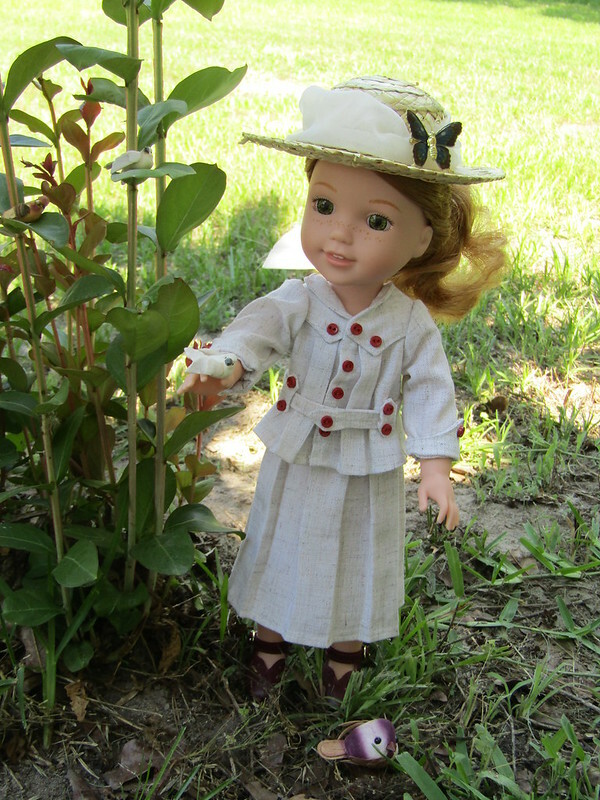 Doll clothes are a vital part of play for children, helping to spark imaginations and create new scenarios. I’m a speech-language pathologist, and at work I see a big difference between language-disordered and typically-developing kids in how they play with dolls. 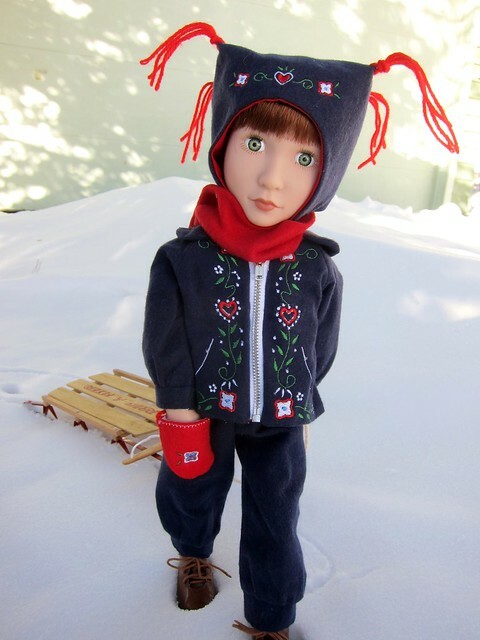 I have a few sets of wooden dolls with magnetic clothing covering everything from princesses to sports outfits to swimsuits. For a kindergartner I might give them the dolls and hold on to the clothes, pretending I’m “the store.” A typically-developing kid will walk her doll over to me and say, “I’m going to the beach, can I buy a swimsuit please?” A language disordered kid is more likely to say something like, “I want a pink one.” If they like the dolls, this is a great way to teach vocabulary. “Oh, you want a pink swimsuit. I bet your doll is going swimming, what else does she need to take with her?” It can also help scaffold stories. 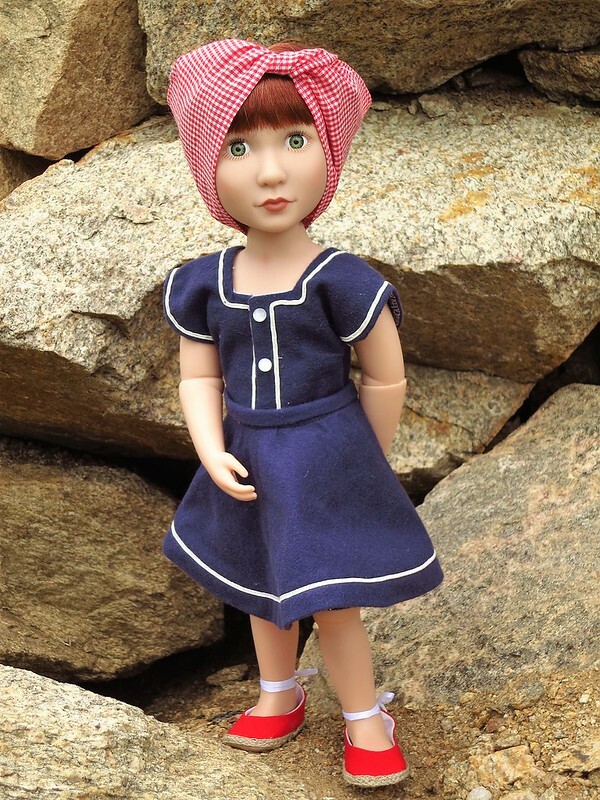 First, the doll gets her suit, towel, etc., next she drives to the beach, etc. 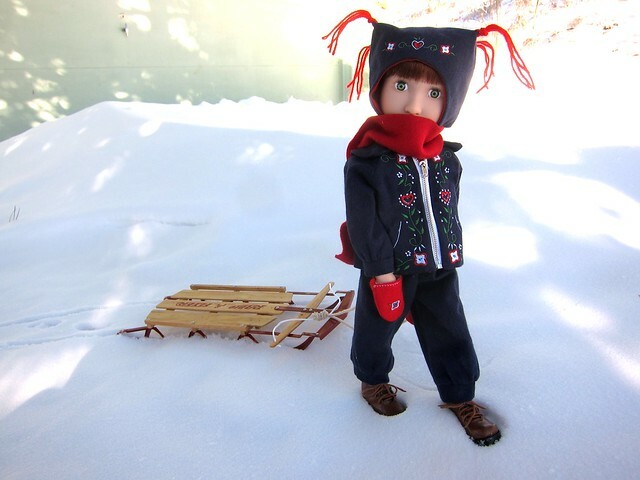 So, although many people might not think of them that way, doll with a nice variety of clothes can be a really educational toy, especially if an adult is willing to add to the wardrobe/join in the play. 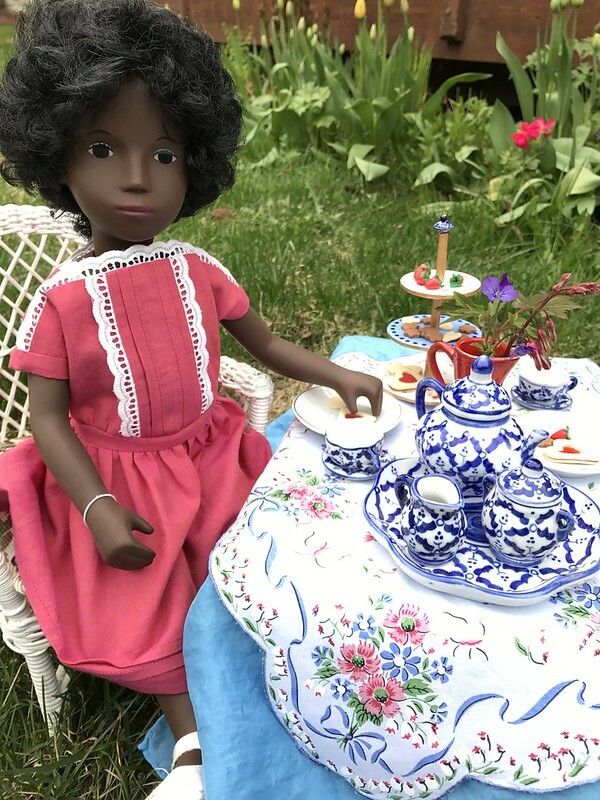 For older kids to adult collectors, sewing for dolls is a wonderful way to “play” with them and develop a valuable skill at the same time. 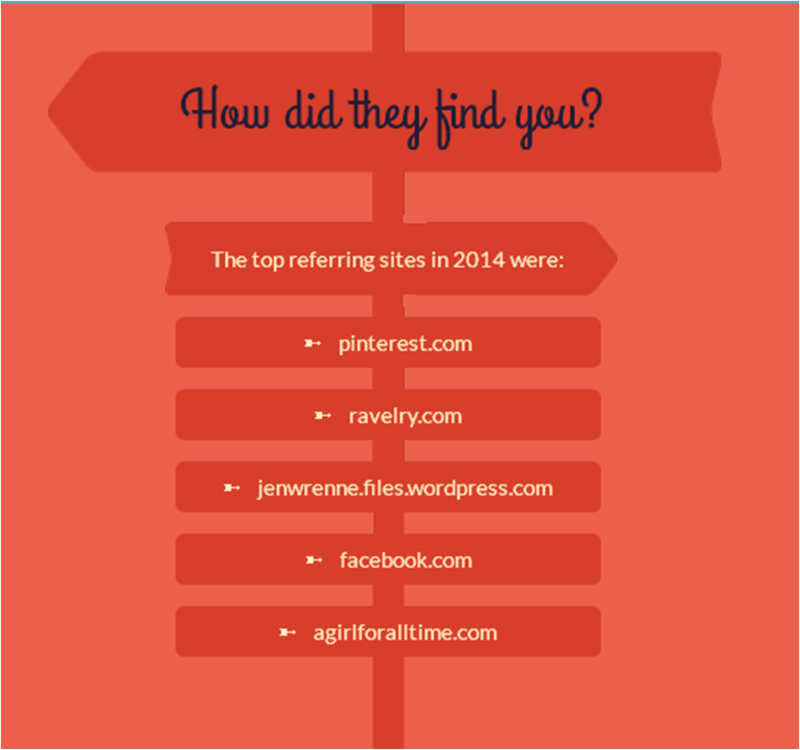 I wasn’t surprised Pinterest was at the top, with 15,272 referrals, as well as referrals from my own site to other patterns on the site. A big surprise for me was how many referrals came from http://www.ravelry.com/ and http://www.agirlforalltime.com/. I guess I hadn’t even realized they knew who I was! 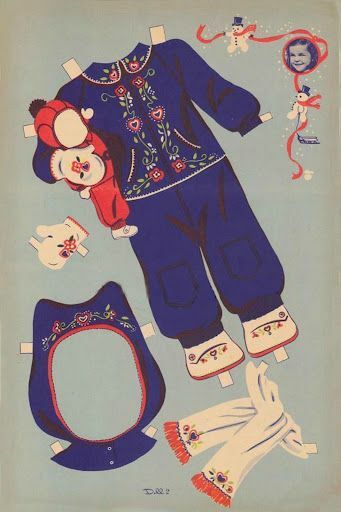 In thanks to AGAT, and because I know a lot of people got a new Clementine for Christmas, I’m offering this new, authentic 1940s snow suit pattern FREE! Thanks for reading the blog! I wish everyone a fabulous 2015! !